Apart from the singularly long hot summer of 2003, The 21st Century has been sparing with its decent weather, at least here in East Anglia. July 2006 was glorious, and I spent the month cycling around heat-hazed Norfolk lanes with one or other of my children. But since then, it has all gone a bit grey. The winters haven't been much better: few and far between have been the heavy frosts, the blankets of snow. It is all getting a bit monotonous, but still the East Anglian late springs and early autumns continue to cheer us. For a few weeks each year, in late May and early October, East Anglia is at its most beautiful. October, soon to come as I write this, will bring us bright, cool days fading out into mist, with the late afternoon smell of turned earth, leaves and bonfires. And May - well, is there a month that Norfolk and Suffolk do better? For then, the trees are coming into leaf like something almost being said, and the birds fill the air with their noisy urgency. The narrow lanes are dappled by the hedgerows, and everything is busily coming back to life. It was on such a day that we headed west from the Swaffham to Thetford road. Gooderstone is close enough to Swaffham for us to have reasonably expected the church to be open - virtually all the Swaffham area churches are kept open - and, indeed, it was. But there was a nagging doubt, because we weren't far off from grimly locked Hilborough and Great Cressingham (although they do have a keyholder at that last church now, bless them). 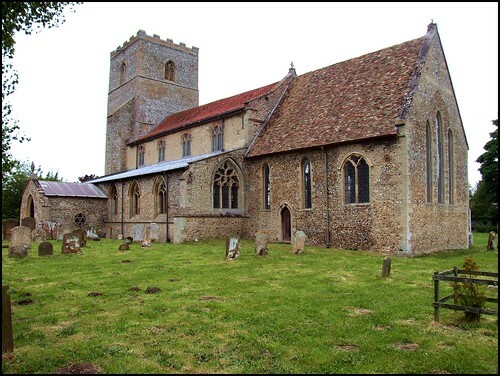 This is important, because Gooderstone is a historically important church, but thanks to its remote setting on the edge of the Breckland it is probably not as well known as some. If it was in almost any other county it would be nationally celebrated. You walk past the war memorial, set rather awkwardly into the wall beside the church gate. Externally, the building is rather rugged, partly a result of having undergone a Decorated makeover of what would have been a large, towered Norman church. In the early 14th century this must have been a glorious building, an outstanding church before the wealth of the following century built up many Norfolk and Suffolk churches into even grander edifices. White's 1845 Directory notes that the parish is also known as Goodson, but I have never heard anybody call it this. The villages around here seem more remote than they really are, being reached along lanes which dogleg absent-mindedly through the heathland and woodlands, occasionally petering out altogether among the fields. So often with a big Decorated church, I enter with trepidation for fear of what might have happened here in the 19th century. No doubt the Victorians did a lot of good in rescuing our parish churches from the neglect of the long 18th Century night, but the rough and ready feeling which I yearn for in such a building was generally anathema to them. However, it is with a big sigh of relief that I saw an interior filled with 15th Century benches, their backs hauntingly decorated with cut-away tracery. Beyond, one of West Norfolk's most magnificent rood screens rises high into the wide chancel arch. Sam Mortlock thought this screen was one of the most remarkable in England. The most intriguing feature is the series of image brackets high up on the mullions, where statues of Saints would have stood guard before the rood loft. 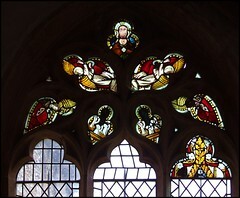 There are the twelve Apostles on the dado, with the four Latin Doctors on the gates. There is more grand medieval woodwork up in the chancel, where a set of stalls sits proudly as if waiting for a college of Priests to come and sit in them. Presumably they once had misericord seats, but these have been replaced, sadly. Looking back westwards, the tiled floor is a not unpleasing setting for all these medieval survivals. All in all, Gooderstone church seemed just about right as a document of the passing centuries. I liked it a lot. To conclude, a curious story. Back in the early 1990s, the Rector here got into trouble with the Bishop of Norwich when it was discovered that he was no longer living with his wife in the Rectory, but had moved in with another woman in Swaffham. Unsurprisingly, the Diocese attempted to get rid of him, but five of the ten parishes in his care decided to support him instead of supporting the Bishop. Five didn't, so as you can imagine there was spectacular disarray at the induction of his successor. The whole business got rather messy, and reached the national press. It has never been fully resolved. One of those curious little quirks that makes the Church of England what it is, I suppose.